‘Tis the season where holiday parties take over your schedule. If you don’t have a Christmas party to go to yourself, chances are your grownup kids have company parties, friends’ yules and other social engagements where the presence of small children is discouraged—in other words, it’s Nana’s cue to babysit! If the grankids are staying over night, Grandma and Grandpa need more than a few DVDs to keep everyone happy and busy. It’s a Hanukka tradition, delicious enough for universal enjoyment. Latkes are pan fried grated potato, flour, egg and other ingredients, ranging from the savory to the sweet. 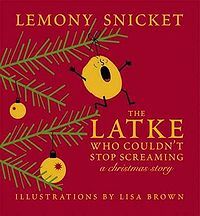 To get the kids in the mood for the holiday season and the Golden Potato Cakes with Ham that I advocate serving for breakfast, lunch or dinner, I recommend the hilarious and charming book, The Latke Who Could Not Stop Screaming by Lemony Snicket. Story hour ought to come with some acessories. If you’re near sighted just like every other Baby Boomer on the planet and can’t read without your glasses, consider getting festive with your eyeglasses chain. I found a site with gorgeous eyeglass acessories, where snazzy green and red chains are a definite posisbility. And while you’re at it, maybe wear a Santa hat—there’s a surprising variety of styles at Party City. 5 Golden Rings…why Top Nana’s Potato Pancakes ROCK! My potato pancakes are an especially welcome treat over the holidays because the golden color of the Yukon potatoes makes you think of the 12 Days of X-mas song and the “5 golden rings” part; that, coupled with the buttery heaven of bright orange sweet potatoes, make these “latkes” as beautiful to plate as they are to eat. Left over potatoes will work just fine in this recipe, as will the addition of diced left over roast beef or turkey. The grandkids will want seconds—just assure them the pancakes won’t be screaming! Which brings me round to my next “latke fun” recipe: Sweet Potato and Toasted Corn Pancakes—for those in your household who like fancy flair, these potato pancakes are even more divine when you top them with sautéed scallops, or serve then alongside barbecued pork. Friends of mine who look after their grandkids in warmer climates LOVE a good barbecue in all seasons; you could also just put the pork loins into your slow cooker and call it a day. It’s no exaggeration to say that I have HUNDEREDS of recipes, suitable for wonderful family breakfasts—so please e-mail me if you’re not that into potato pancakes and would prefer something else. Also, keep my Jorj.com blog on your radar. Soon, I’ll post a yummy new link to the Nana Network; stop reading if you don’t like spoilers! Make sure you hit “the like button” so you get the immediate scoop on a holiday menu inspired by the fabulous food in Dicken’s beloved classic, A Christmas Carol.